Former Catalan president Carles Puigdemont said on Friday that ‘Europe cannot be accomplice’ to the public prosecutor of Spain’s decision to ask request sentences for members of the Catalan government, civil society leaders and the former Parliament speaker. The prosecution announced that it’s asking prison sentences of 25 years for former vice president Oriol Junqueras, 17 years for two civil society leaders and the former speaker, 16 years for five former ministers in jail and 7 years for three others currently on bail. ‘Having political prisoners is a disgrace. Organising a political trial, persecuting and condemning people for their political actions is crossing every red line. Europe cannot be an accomplice, with its silence, to this abuse,’ Puigdemont said in a video message from Belgium, where he is currently exiled. Puigdemont added that the EU risks ‘losing its credibility as a guarantor of freedoms and civil and political rights,’ if it accepts Spain’s attitude towards Catalonia. ‘Today in Spain, allowing a vote with ballot boxes is the worst crime that can be committed,’ said the former Catalan president, stressing that his former colleagues ‘did not commit any crime’ by organising a referendum. 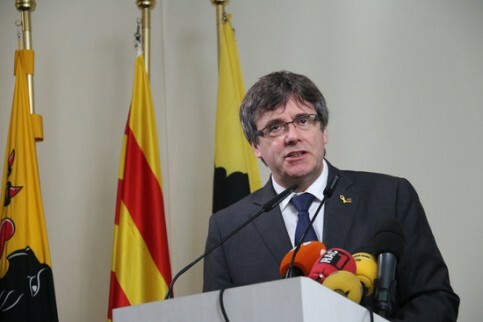 According to Puigdemont, the prison demands are part of a ‘revenge’ strategy by Spain, which didn’t accept the Catalans’ ‘democratic’ and ‘non-violent’ calls for independence.